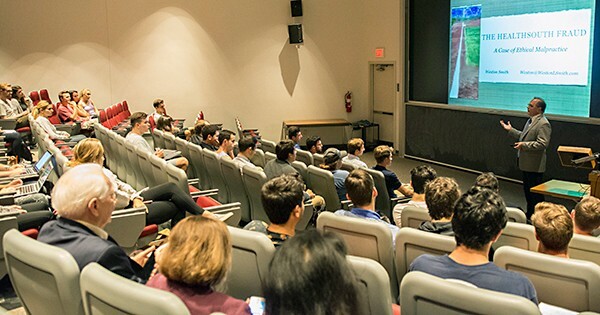 The former chief financial officer of HealthSouth Corporation, Weston Smith, visited the University of Delaware in October to give a lecture on the lessons he learned from his experiences with the company and the events that landed him in federal prison for fraud. Scott Jones, professor of accounting in UD’s Department of Accounting and Management Information Systems and interim associate dean at UD’s Alfred Lerner College of Business and Economics, said that students can learn valuable lessons from experiences like Smith’s, especially given the critical role that financial crises have played in the recent history of the United States. Speaking to a joint meeting of the UD student chapter of the Center for Public Trust and the Blue Hen Investment Club, Smith described to students the way that over 12 years, HealthSouth grew into a Fortune 500 company with over 2000 locations in all 50 states and five countries, specializing and operating in outpatient rehabilitation centers, surgery centers and diagnostics divisions. The company continually exaggerated company earnings to meet the expectations of investors, and Smith ultimately came forward to expose the fraud of the company and take responsibility for the mistakes he made in maintaining the fraudulent activity. He faced the consequences for these actions in the early 2000s, serving 14 months in federal prison. Smith now lectures around the country on ethics, and the importance of staying true to one’s character and values. During his presentation at UD, Smith discussed whether business ethics and general ethics should be treated as the same. He said that he recognizes the different types of fraud that exists in the business world, and that fraud can be subtler than people might realize. He admits that he made many bad decisions along the way, and stands firmer in his values today as a result. Kamren Tinsley, a junior business management major, said he thought one of the most thought-provoking parts of the lecture was how Smith maintained his position at HealthSouth. The lesson that Smith emphasized the most during his lecture was to always stay true to your values, and to make the right decisions, no matter how much someone else is pressuring you to make the wrong choice. Students who are interested in programs about ethical leadership are encouraged to learn more about the UD student chapter of the Center for Public Trust.